After winning at MomGen's Craft Corner giveaways. I've waited for my Grand Prize to arrived in mail. And there you are, I'm so happy to received this packet that includes lovely bracelet, cards, for scrapbook things and more. And I eventually used it already too. Once again, thank you so much momgen for the contest. wowee! congrats gandang Novah! ganda ng prize ah! kainggit! ay.. kita ko na ang blogroll. sorry ha. nalito ako at first. thank you very very much. congrats! 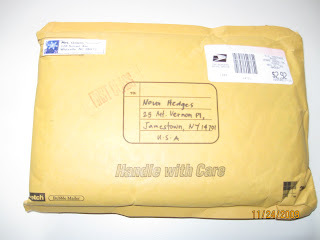 momgen is really very nice, I won a special prize in her contest a few months ago, and she sent my prize thru mail also.